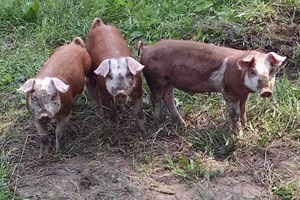 We currently have partnered with another farm, Greener Grass Farms from Quincy, MI to offer pastured pork. 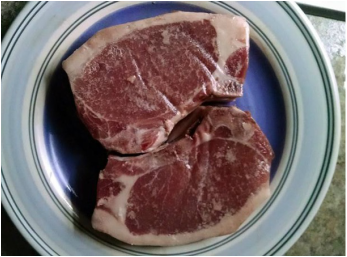 They do an excellent job of producing pastured pork and use the same management practices that we have been following. The breed of pigs are Large Black, Berkshire, Hereford, York crosses. The Hereford and Large Black breeds are a heritage breed. Pigs are born right on the farm where they learn from an early age to forage for their food from their parents. They stay out on the pasture until they are ready for market at around 6-8 months of age. During the time they are grazing out on pasture they have a multitude of forage choices, including clover (their favorite), grasses, sorghum sudan grass, buckwheat and many other varieties. They are fed a small diet of gmo free grains, minerals and all the weeds they can eat! Pigs are free of added hormones and antibiotics. They are wormed using all natural worming methods. The finished market animals are processed at an USDA inspected facility, Pease Packing in Scotts, MI. They are a small producer that handle the animals very well throughout the entire process. Customers call in their own orders, but we are happy to help determine what cuts you may want. Each cut is vacuum sealed with a label on the package containing the cut name & weight, farm name and date.